Pancetta. Bacon’s fancier Italian cousin. Good God, how I love the stuff. Salty, luscious, slightly spicy, porky goodness that is the essential flavor in so many of my favorite foods. If I could, I would probably put it in everything. The problem is that it really isn’t very easy to find in most grocery stores and, when you do find it, it can be crazy expensive. Plus, I am always a little leary of food with a bunch of ingredients I don’t recognize. I buy pork belly pretty frequently for lots of different recipes (check out this easy spicy pork belly that I love to use in tacos) so I thought there must be way to make pancetta myself. Cue the frenetic, silly search music and picture a movie montage of me with about a million different books and websites about curing meats. It took some digging since I can’t hang the meat in a cool basement or attic like most recipes called for. I also didn’t like that most of them still called for additives that I wasn’t really inclined to use. I also wanted just the right spice blend to complement the pork. Ideally, it would also include at least one ingredient I could grow myself (in this case, bay leaves). After some serious searching, I finally found a couple of recipes that I thought I could blend together to make the perfect pancetta. 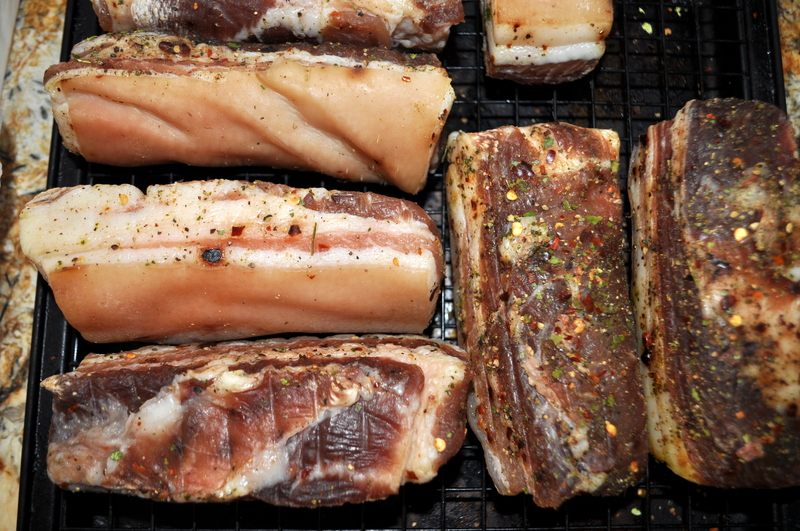 Arrange the pork belly on a wire rack to ensure the bottom of each piece gets cured and doesn’t retain moisture. This recipe is made in the refrigerator so there is no fear of fluctuating air temperatures breeding mold on your meat. Though it takes some time, there is very little hands on work involved. I like my pancetta pretty spicy but you could lessen the amount if you aren’t a fan of heat. Since you are working with many pieces of pork belly, you could actually make a few different spice blends if you wanted to. The main thing you need to do is make sure you wash all the salt off the pork belly before you add the spices. It might seem like 24 hours in the salt wouldn’t leave the meat very salty but believe me, it’s plenty! Use the white wine to stick the spices to the meat and then make sure there is room for airflow under and around each piece. Lightly cover the pan with parchment paper to make sure nothing in your fridge contaminates the flavor but don’t seal it up. The airflow is what will do the work of curing the meat. Once you two weeks are up, you will have a delicious pancetta that is ready to use in any recipe you like.